The reported details of what she’s doing in these photos take this whole thing way deeper though. Apparently inside that FedEx package are the papers that will set her free from charges she’s facing for driving with a suspended license Ie. she’s signing off on a plea deal. This is what her lawyers were working on yesterday in court where Amanda was a no show, ostensibly too busy trying on athletic wear from 2002. Amanda, however, wasn’t willing to admit she missed her court appearance, insisting on Twitter that these photos are of an imposter. The tweets have been deleted, but DUH, obviously not before being screen grabbed (see below). The idea that there is a Bynes doppelganger out there wreaking havoc on us all is a very appealing explanation for whatever it is that she’s become over the past year. 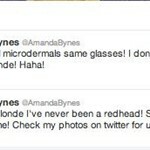 Maybe because today is Amanda’s 27th birthday, let’s all go along with it? It’s as if the world is like The Double, that Dostoyevsky story they make you read in college, except instead of a Russian government worker it stars a once beloved American child actress. Also like that book, I don’t understand what the f*ck is going on with Amanda and her pink-haired proxy, but I’m sure the world is a richer place with them in it. And at least when we’re reading about Amanda, none of us is stuck sharing an 8X10 room with Ivan Chan.